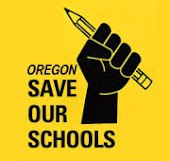 Oregon Save Our Schools: Can Children Be "Too Young To Test"? Can Children Be "Too Young To Test"? For the first decade after the No Child Left Behind Act passed in 2001 -- putting into high gear the testing-based model of education -- almost all standardized testing took place in grades 3-8 and 11. Little children were the only ones spared being subjected to the data-driven “business model” approach to learning, with its fixed testing targets and its multitude of accompanying charts and graphs. No more. Little children have now caught up with their older siblings in the testing derby, on track to join them in taking over 110 standardized tests by the end of high school. Yes, 110. Teachers in pre-kindergarten through grade two have now joined their teaching colleagues in the older grades in the pressure cooker to produce “accountability” data to match predetermined benchmarks. Little children are now joining their older siblings in experiencing the sidelining of art, music, creative play and other non-tested curriculum. They too are now spending more and more of their day in “seat time”, focused on tested subjects. They too are now being repeatedly “tested, sorted and tracked”. Their teachers know this is developmentally inappropriate. They know it is clearly wrong. But they are not allowed to tell you that. They are not allowed to tell you that most high-performing countries in the world test once in elementary, once in middle school and once in high school. They are not allowed to tell you that teachers already know full well how to identify kids who are struggling with reading, writing and math. Over the ages, teachers did not need multi-billion dollar testing corporations to tell them. Oregonians have an opportunity to change things in a good way. We have the chance to say “No” to the developmentally-inappropriate and harmful practice of testing-sorting-tracking little children. We can say “No” to the drive to minimize their other important qualities, such as creativity, divergent thinking, and problem-solving. One way to change things is for all of us to tell our legislators to support the “Too Young to Test” bill, (HB 2318), that has been introduced by Representative John Lively (D- Springfield). It would prohibit the state government and local districts from standardized testing little children from pre-kindergarten through grade two. It is modeled on legislation in New York, New Jersey and Illinois. It would allow teachers to make their own professional decisions about which assessments to administer. The second way is for parents to “Just Say No” to every form of standardized testing that they can. This is where the ultimate power is: If parents say, “No more” -- by opting their children out -- the testing juggernaut will begin to collapse. We could then join much of the rest of the world in giving a few, well-constructed, classroom-based assessments – and save our kids from harm, save our teachers and principals from dispirited burnout and save taxpayers tens of millions of dollars a year. After all, what have Oregon parents, students and taxpayers gotten for the hundreds of millions of dollars we have spent on standardized testing for the past 20 years? Is the dropout rate better? Has the “achievement gap” among ethnic groups and economic classes improved? Is teacher burn-out and turnover up or down? Are students more engaged with their own learning? There is no ethical or curricular justification for repeatedly standardized testing very young children - or any of our children. Let young children experience the joy of learning and the thrill of making, doing, exploring, and play. They are indeed “Too Young to Test”. Do two things for our little ones: Support HB 2318 and encourage your friends to Opt-Out. Roscoe Caron and Larry Lewin are retired Eugene School District middle school teachers and members of the Community Alliance for Public Educatin (CAPE). Pat and Jan Eck are retired elementary educators and founders of Angry Grandparents Against High Stakes Testing (AGAHST). All are members of the Oregon Public Education Network (OPEN), which defends public education. Check out their websites: oregoncape.org. and orpublicednetwork.org This article originally appeared in Eugene Weekly and was republished here with permission of the authors.